The Mousetrapped is a gift for theatre lovers, from The Cacophonee Ent. It’s an interpretation of the longest running play in the History of English theatre inspired by Agatha Christie Classic- Three Blind Mice. The play will be staged at the Alliance Francais. The spine chilling murder mystery aims to connect with the city’s theatre lovers as well as Christie fans. 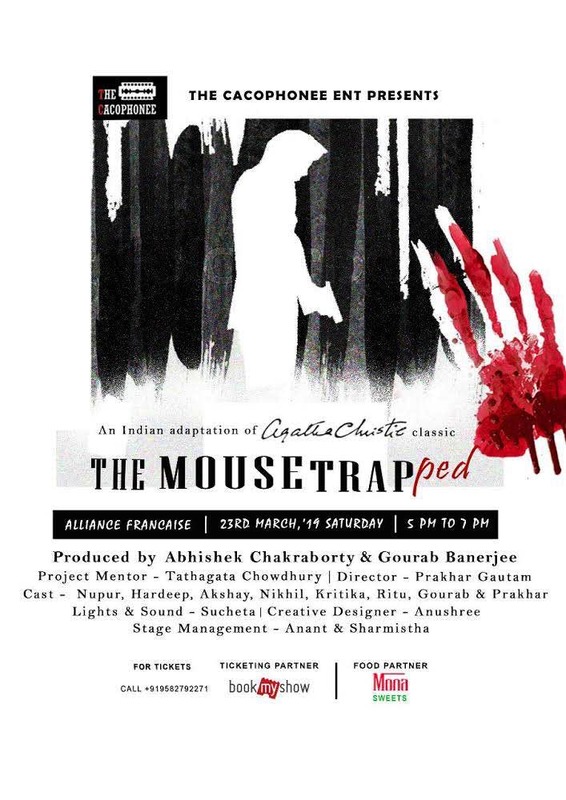 Produced by Abhishek Chakraborty and Gourab Banerjee, directed by Prakhar Gautam and mentored by Tathagata Chowdhury The details of our upcoming show are as follows:- Play - The Mousetrapped Genre - English Thriller Presented by - The Cacophonee Ent Previous Show Records- 3 Houseful Shows at Akshara Theatre, New Delhi.